In 1950, the Brooklyn Dodgers finished 2 games out of first place in the National League, behind a .400-OBP, 7-WAR season from Jackie Robinson, three players cracking 30 Home Runs (Roy Campanella, Gil Hodges, and Duke Snider), and plenty of pitching from workhorses Don Newcombe and Preacher Roe. Looking on from the broadcast booth was a 22-year-old who had been hired by Red Barber to supplement the team's radio and television broadcast team. Three years later, Vin Scully became the youngest broadcaster to call a World Series game, a record that stands today. Five years after that, Scully followed the team on its cross-country relocation to Los Angeles. And now, in 2016, the greatest broadcaster in sports history is retiring. Scully has influenced, and even created, generations of baseball fans, calling some of the most iconic moments in baseball history while also having the skill to make a trivial late August game just as entertaining. As someone who roots for an East Coast team, I've spent many nights switching to the Dodgers the moment my team finished playing. As a fan of an NL club, one of the highlights of every season is my team's annual road trip to Dodger Stadium, just for the chance to switch to the Away Feed on MLB.TV. This Friday, the Los Angeles Dodgers will celebrate Vin Scully Appreciation Day, even though for most LA-based baseball fans, that happens every day. On Sunday, he'll call his final game at Dodger Stadium. And, a week later, he'll call the final game of his career, traveling to San Francisco for one last Giants-Dodgers showdown. To pay tribute to our favorite announcer, we've dug through the Baseball-Reference database to relive some of the greatest games, seasons, and statistical tidbits from Vin Scully's extraordinary career. Even in his penultimate year, Scully had the chance to call real history. Greinke's ERA+ was 222, meaning that, adjusting for park, he was 122% better than the average pitcher in 2015. That's only happened 16 times in Major League history, and just eight since 1915. Greinke's achievement is a testament to how much the game changed over the course of Scully's career. In 1965, Sandy Koufax went 26-8, with 335 2/3 Innings Pitched, 382 strikeouts, 27 complete games, and a 2.04 Earned Run Average, good for 8.1 Wins Above Replacement. 50 years later, Greinke went 19-3, with 222 2/3 IP, 200 SOs, one CG, and a 1.66 ERA. However, the baseline for starting pitchers changed so much over the last half-century that Greinke's season was worth a full win more than Koufax's. 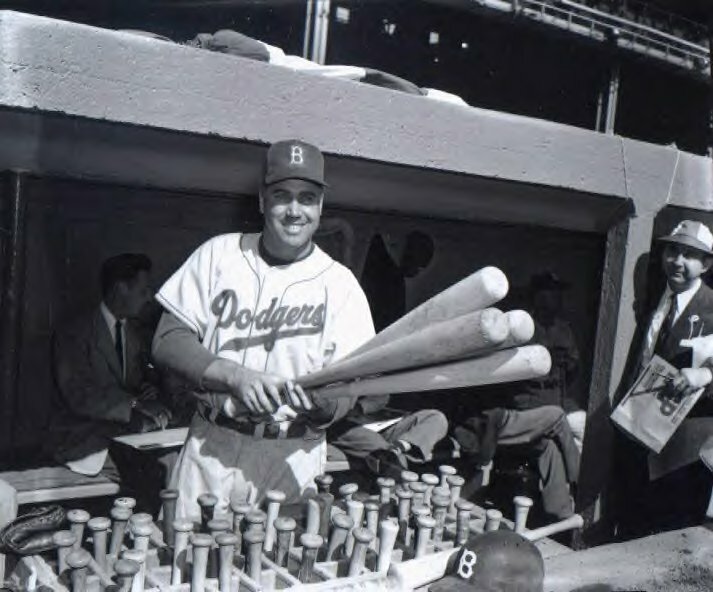 Whether you prefer Home Runs or Isolated Power, Duke Snider is the best power hitter in Dodgers' history and his 1953 season was one to remember. He led the NL in Slugging Percentage (.627) and Total Bases (370), as well as On-Base Plus Slugging and Runs Scored. Not only that, but he did it all while logging over 150 games at the defensively crucial position of center fielder. No surprise, then, that Snider was the best position player in the NL by WAR, trailing only Robin Roberts for the NL WAR title that year. Despite that, Snider lost the MVP to his teammate, Roy Campanella, whose 1953 wasn't too shabby in its own right (7.1 WAR, 41 HRs). Perhaps one of the most underrated players of the 2000s, Beltre's certainly not the first person to come to mind when you think about Dodger legends. Maybe he should be, considering there was only one season by a hitter that was better than Beltre's 2004 in the Scully Era. Beltre bashed 48 HRs that year, one shy of the Dodgers' single-season record, and became the second player in Dodger history with 40 HRs and 200 hits in the same season. And he did all of it while playing the top-notch defense at third base that would become his hallmark. But as good as Beltre was in 2004, he still came up just shy of a season that happened when Vin Scully was just 23-years-old. Robinson, nine years older than Scully, had a career year, posting a batting line of .338/.429/.527 for a career best 154 OPS+. He paired his only season with eight or more offensive WAR with an extra two wins of defensive WAR. The outcome: the best season by a position player that Scully would ever call. When you think of the Dodgers, you think of three men: Robinson, Scully, and Sandy Koufax. Koufax's 1963 was the best season by any Dodger, regardless of era. That year, Koufax had a mind-boggling 11 shutouts and allowed just 58 walks over 311 IP, to go with 306 strikeouts and a 1.88 ERA. While his 1963 was better compared to a replacement player from that year, his 1966 stat line may be more impressive. In 41 starts, Koufax went the distance 27 times, pitched 323 innings, and struck out 317 batters for an ERA of 1.73. With the caveat that Play-by-Play data is not 100% complete before 1974, I thought it might be fun to look back at some of the most exciting games that Scully had the chance to call. For the team games and hitters, we'll use Win Probability Added, which shows how the outcomes of individual plays affected a team's probability of winning. For pitchers, we'll use Game Score. One more caveat: with his responsibilities as a national broadcaster, we can't be 100% sure Scully called all these games. However, three of them were on weekdays, so it's highly likely Scully was on the call, and for the fourth, I found video to confirm it was him. The Dodgers had an 81% chance of winning this one going into the bottom of the 7th inning with a 5-3 lead. Then things went haywire. Three singles, a walk, and an error gave the Philadelphia Phillies a 6-5 lead and reduced the Dodgers' win probability to 23%. It would fall to 18% after John Shelby flew out to lead off the eighth. However, the Dodgers rallied, scoring two runs to retake the lead and give the team a 72% chance of getting the win. But the Phillies weren't done. In the bottom of the eighth, they scored two runs to retake the lead. The Dodgers's win probability fell as low as 7% before settling in at 15% going into the ninth inning. That wouldn't be a problem for the Dodgers, who promptly hit two doubles and single to retake the lead. They'd notch another run before getting out of the ninth, then hang on for a dramatic victory that ended up presaging a wild season. In a game so long the WPA chart doesn't fit in one row, the Dodgers fell to the Houston Astros after playing more than two full baseball games' worth of innings. The Dodgers took a 2-0 lead in the first and cruised until the sixth. By that point, they were leading 4-1, but a two-out rally, sparked by three straight walks, tied things up at 4. That's where the game would stay for the next 14 innings, despite both teams getting a baserunner to third (the Dodgers in the eight and the Astros in the 11th and 15th). Finally, in the 21st inning, the Dodgers seemed to have their moment. A walk and single put Mike Scioscia and Willie Randolph on, while a passed ball moved them to second and third with nobody out. The Dodgers proceeded to strikeout, ground into a fielder's choice at 3rd, and lineout, ending the rally without a run. One inning later, the Astros finished it off with a Rafael Ramirez walk-off single off the glove of Fernando Valenzuela, who entered the game in the 21st inning, not to pitch, but to play first base. Also, shoutout to this Expos game, two months later, where the Dodgers actually had a worse WPA, but escaped with the win in another 22-inning affair. Aaron gets the honors here for basically single-handedly getting the then-Milwaukee Braves back into a game that seemed lost. Trailing 5-1 in the bottom of the sixth, with two outs, Aaron hit a solo home run to reinvigorate the Braves. Two innings later, he'd hit a leadoff single and go on to score their fourth run, making it a one-run game. With two outs in the bottom of the ninth, Aaron hit a fly ball to centerfield that was misplayed by Don Demeter, who came into the game in the third. The tying run would score on the error, forcing extra innings. However, Aaron would save his best play for extras. After a Gil Hodges sacrifice fly gave the Dodgers a 6-5 lead, Aaron hit a one-out HR in the bottom of the 11th to extend the game, swinging the Braves' win probability from a mere 10% to 57%. The Dodgers learned their lesson, and, with another chance to win in the bottom of the 13th inning, they'd intentionally walk Aaron with two outs and a runner on second. Wes Covington would groundout to first, ending the game. As for Dodgers' players, the best WPA in a game in the Scully Era goes to Raul Mondesi, who went 4-6 in a dramatic comeback win against the Arizona Diamondbacks. In the second biggest upset of this column, Sandy Koufax's perfect game did not receive the highest game score in a Scully Era Dodgers game. Instead, that honor goes to this 1974 start by Tom Seaver. Seaver allowed three hits and a run, but he also pitched 12 innings and struck out 16 batters, a feat not likely to be duplicated any time soon. The biggest upset? Koufax's start didn't even receive the best game score by a Dodger! Instead, that goes to Clayton Kershaw's no-hitter. Perhaps nothing defined Vin Scully's career quite like the Giants-Dodgers rivalry. Scully grew up a Giants fan before being employed by the Dodgers. In just the second year of his career, he worked on the losing side of the Shot Heard Round the World. And, of course, his final game will be a Giants-Dodgers game in San Francisco. In Scully's career (with the caveat that B-R doesn't actually track announcing crews, so Scully likely missed at least some of these games due to his national broadcasting work), the Dodgers faced the New York/San Francisco Giants 1,213 times, the most of any opponent in that span. In that time, the Dodgers won 625 times and lost 588, meaning they'll end the Scully Era with a winning record against their fiercest rivals. In total, the Dodgers played 10,634 games since Scully joined the broadcast team in 1950. Their best record against an NL opponent in that span is their 271-194 mark against the Expos/Nationals; their worst is actually their winning percentage against the Giants, meaning they have a winning record against every NL team (including the league-changing Milwaukee Brewers and Houston Astros) in the Scully Era. One of the few teams they do have a losing record against in that span: their neighbors in Anaheim. The Los Angeles Angels are 61-49 against the Dodgers. Few figures are more deeply ingrained in the fabric of the game than Vin Scully. Unlike players, whose careers may only last a few years, Scully's has spanned decades. Unlike managers, owners, and executive, whose public interaction is usually brief and curt, Scully has generously spent every second of more-or-less every Dodgers game for 66 years talking to the fans. This entry was posted on Wednesday, September 21st, 2016 at 1:39 pm	and is filed under Announcement, Baseball-Reference.com. You can follow any responses to this entry through the RSS 2.0 feed. Both comments and pings are currently closed. Thank you for a wonderful article with a neat perspective. Really enjoyed reading this. for telling the truth. God bless you Vin. This is awesome, thank you for this post. Vin Scully is the finest broadcaster (not just sports) in history. His kindness and decency is also appreciated. Wonderful tribute to Vin Scully! Will always remember the calls of the game, and the stories surrounding the game as so graciously served by Vin as a fan of MLB A nd yh ed World Series. Thanks for sharing these moments! This Sporcle quiz was interesting: http://www.sporcle.com/games/swiggetyswagwga/hall-of-famers-that-played-during-vin-scullys-career-1. Scully spans a huge swath of history. There will likely be additions to the list of Hall of Famers he covered for decades. The most exciting game may be this: In Vin's last home game of 2016, Dodgers went from 60% WPA to 18% when Jansen gave up a home run to Dahl to put Colorado ahead 3-2. Dodgers were down to 4% WPA with 2 out in the bottom of the ninth and Seager hitting a home run to tie the game 3-3. Culberson later hit a walk-off home run (his first HR since 2014) in the bottom of the 10th for a Dodger 4-3 win, and a clinch of the NL West. Vin followed with a rare speech from the booth, followed by a recording of himself singing "Wind Beneath My Wings" while the players watched from the middle of the field. Then the players returned to celebrating. I can't believe it! I've been listening to Vin for 45 years. I was in the stands at the Ravine for a game on April 23, 1999. This game witnessed the greatest WAR in any one inning by a position player: Fernando Tatis hit two grand slams in the 3rd inning. On a side note, Chan Ho Park gave up both slams, thank you Davey Johnson. up the KFI broadcast from LA.